Excerpt of my interview with Lee Odden. Video production by my friends at Candidio. Fast, inexpensive, quality video production. Transcription services from Speechpad. For full conversation, watch the video! by a very special guest, my friend Lee Odden, live from somewhere. 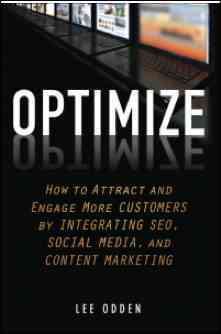 . .
date was yesterday, called Optimize: How to Attract and Engage More Customers by Integrating SEO, Social Media, and Content Marketing . Lee, how are you? Thanks for being here. suppose, and so, you know, to keep people guessing and that sort of thing. many ways to answer the question. became an employee that became a partner and then I’m doing what I do now. Google Facebook Pinterest conglomeration is. Lee: Yes. It’s mechanical, not meaningful. Google Handles 11 Billion Inquiries Per Month. Twitter Handles 350 Billion Tweets Per Day. Lee: Yeah, that’s from Comscore. Jay: And Twitter has 350 billion tweets a day? Lee: 350 billion tweets a day. Jay: But the reality is, the reality is that we think about Google as this like all-knowing, all-seeing cyborg. But yet, in terms of actual level of inquiry, level of chatter, Twitter and Facebook and those guys are right there. great, well we’ll just make more content, right? But your belief, i.e. this book, is don’t necessarily make more content. Optimize that content. And how does that yield better outcomes? responding to the content issues by saying you should make more content. content plan around that and that’s a qualitative effort, I think, right? the buying cycle, buying behaviors are, right? you know, search and social media optimization. really talk about creating personas from a place of data inputs, right? take that information and create personas based on that. that process look like for you? retail and SEO, retail and social media. do is say, I think that’s interesting. I’m going to write about that. people want and let’s give them that. monetize the blog in any way. It’s been free for all, for eight years now. know, we follow that kind of guideline. hills? Are you freaked out? Are you going to stop using it? 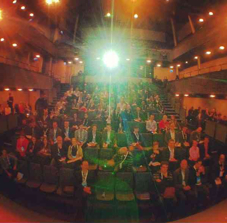 Is THIS Lee Odden’s best-looking audience? I did for a blog post today. people’s photos that they’ve taken. they may do all those things. But I don’t think it necessarily means that. Lee: Well, you know, everything’s not in there. Jay: “All the good stuff is not in Optimize ,” says Lee Odden. into value, that’s requires experience and knowledge, not just information. company up in the world to be a client. much for being here. Congrats.